Kavala is a beautiful city in the region of Macedonia, Northern Greece. It is located approximately 160 kilometres east of Thessaloniki, the Macedonian capital and second largest city in Greece. Kavala is a coastal city, overlooking the Bay of Kavala in the Aegean with a picturesque fishing harbour and reliable ferry links to Thasos as well as several other islands. The city is often described as one of Greece’s most attractive thanks to its stunning setting and traditional surroundings. It is also perfectly situated as a base for visiting other places in Northern Greece, with regular bus connections to Thessaloniki. Other locations of particular interest which can be visited easily from Kavala include the Ancient site of Philippi, the Nestos River Delta, Thasos, Halkidiki, the city of Xanthi as well as the mountainous, heavily forested regions to the north of Kavala and Drama. The airports of Thessaloniki and Kavala provide access to most visitors from abroad. Over the centuries, Kavala has had numerous different names, one of the most significant of which was Neapolis, given by settlers from Thasos who founded the city around the 6th Century. It has always been part of Macedonia and used to function as a port for Philippi, 14 kilometres inland from Kavala. This coastal location was to prove valuable for the confrontation of invasions from Thrace. During the Roman Period, Brutus and Cassius used Neapolis as a base for their fleet during the battle of Philippi. It was during the Byzantine Period that Neapolis’ name changed to Christoupolis and was to belong to the Byzantines as one of the last props of their state. During 1375 the region of Eastern Macedonia came under Greek command, only for Christoupolis to be conquered by the Turks in 1387. For four years they occupied, plundered and destroyed her. The Venetians conquered Christoupolis in 1425 for just a month until the Turks returned. It was around this time that the history of Christoupolis ended and that of Kavala began, with Greek and Turkish settlers, along with Jewish prisoners brought from Hungary by the Turks. This is the population group that was to build the old town of Kavala, now referred to as Panagia, shown in the photo below. There is a range of activities and sites to suit all tastes, including beautiful white sandy beaches and traditional Greek tavernas in the local fishing villages, many of which offer nights of traditional dancing during the summer months. The municipality of Kavala has a huge choice of beaches, with a long winding coast road which meanders from the village of Nea Peramos, 15 kilometres to the west of Kavala, all the way to the city centre. Starting with the beaches near Nea Peramos, these are just beyond the village, approached through vineyards. The area is called “Ammolofoi”, or “Sand Dunes” and is made up of a series of bays, each with its own white sandy beach. During the summer there are free umbrellas and sunbeds with small bars which have waiter service from the beach. In peak season this area is busy with local bathers. However, for the rest of the year it is not uncommon to find an empty beach to oneself. Access by car is easy with many parking places at the roadside. Heading east, having passed Iraklitsa, the road to Kavala passes through the village of Palio. Traditionally, this is a location where many people from Kavala have summerhouses. There is a playground, a small supermarket and many pretty little beaches overlooking “fydonisi”, or “Snake Island”. As people generally visit these beaches on foot from their homes, they tend to be relatively quiet and are ideal for swimming or sunbathing in peace. Those seeking a more exclusive location should head to Tosca or Batis. These are privately owned beaches, which have an entry fee, (although fairly reasonably priced) allowing use of the shower facilities, sunbeds and umbrellas. There are also restaurants and bars. 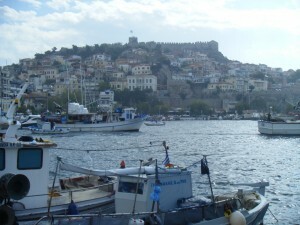 Kavala offers a large number of fish tavernas and other traditional Greek eating places, many of which are located at the extreme eastern end of the harbourside, on the way to the Thasos ferry departure point. Those heading further afield on the search for good tavernas should go to Iraklitsa, a local fishing village with many high quality, family run tavernas where many people from Kavala go to eat, especially at weekends. There are also traditional Pizza Houses with charcoal ovens. Anyone feeling particularly adventurous with the means to head inland to areas such as the Nestos Gorge or the town of Xanthi will find smaller, rural family tavernas which offer local home cooked food of the very highest quality, often for very low prices. This is possible thanks to the continued availability of locally reared meat. Specifically, the village of Stavroupoli has a handful of tavernas overlooking the forest below, serving dishes such as succulent veal and tomato stew and fresh beetroot salad.